If you have been searching for a travel trailer to accommodate ten sleepy campers, take a look at this Jay Flight SLX 8 294QBS. You and your spouse can sleep on a queen size Simmons mattress in the semi-private front bedroom while the kids sleep on the four bunks in the rear bunkhouse. 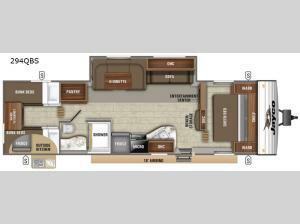 The main living and kitchen area includes a large slide out allowing more floor space for everyone, plus the Jackknife sofa and the booth dinette provides extra sleeping space for four overnight guests. If you like cooking outside the outdoor kitchen is perfect for you. Check it out today!